Today is Palm Sunday, so I thought it a great day to share my second take at this week's Mojo Monday Sketch! The cross stamp I've used is another 'vintage' one from my collection by PSX. I've always loved it simply embossed in gold or silver, but I've not found my embossing powders or my heat tool, so I decided to do some simple 3D layering instead, stamping on the patterned paper and then again, layered with foam adhesive squares. I changed up the sketch slightly to accommodate a smaller image, taking my flowers up the left side of the card. I've used two sides of one of my fave Basic Grey papers, and I love how it came together for this card. Here's a close up of the cross- it was stamped in Archival black ink on kraft paper that had been sprayed with some ColorShine by Heidi Swapp. I love the shimmery texture it adds. 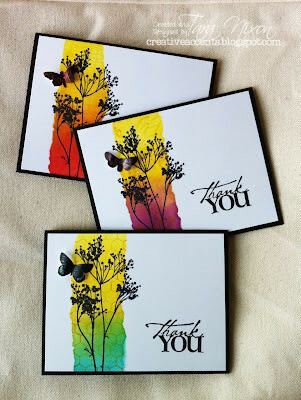 I'm entering this card in the current challenge at Chocolate, Coffee & Cards whose theme is yipes stripes! I love this Tara! You did an amazing job! I have that Happy Easter Stamp too! Thanks for sharing!